On Tuesday, day 18 of the present and facing one of the largest seating capacity of the last exercises on the Club de enófilos of Valencia, La Bodega de Alboloduy of Almeria, within the appelation of Ribera del Andarax, presented their wines in Valencia. Following the presentation of the winery and its surroundings by its owner, D. Francisco Calvache , we went to taste varieties almost, almost extinct today and southeastern native Spanish as the Jaén Blanca. In this variety we tasted the 2010 vintage and the 2011 premiere, still bottled but not especially different. Also tasted the wine premiere rosé, flower harvest of a grape wine syrah, then surprised us in the working aged 2005 and 2007 with 12 and 18 months aging in oak barrels. 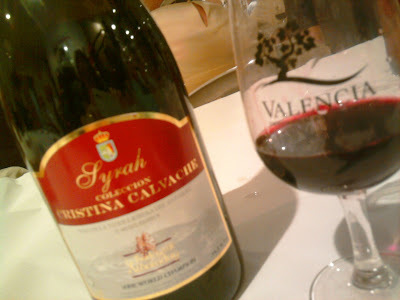 A well structured syrah, without edges still very much alive, ripe red fruit, oral explosion and the 2005 vintage smoothness of edges in 2007, still trading, but soon we will have this vintage on the market, Cristina Calvache Collection is his name. The Collection Cristina Calvache Cabernet Sauvignon 2007, also came from 12 months in barrel, had to wait a few minutes in the glass to show its full potential, a robust wine, powerful aromas of ripe black fruit, spices, cocoa coverage ... promising wine, not for tasting, accompanied by a strong best roast or stew meat, game and sumptuous dishes and clean your tanning needs fats and proteins that remain in our mouth when we eat foods such as those mentioned above. Finally a wonderful tasting I hope we bring supporters to the cause of different wines or author, always looking to find suggestive emotions and feelings that lead out of the boring and routine. This past Saturday at the winery Vera de Estenas, a member of the DO Utiel-Requena, has held a family event and aimed specifically for children, I mean the painted barrels to round off the end of this harvest in the vintage 2011. Success sounded and left more than attendance and participation, more than 100 people, children and adults having fun on the outside of the cellar, the smallest part that left us a nice souvenir art painting over twenty barrels , the winery made ​​available to the attendees, and moreover adults with guided tasting of the prestigious sommelier Pere Mercado with three wines, prepared by the winery, which were tasted at the event. Younger children had a fabulous wine unfermented grape Bobal, while older began with a Cava Brut (sparkling wine) tasting made ​​from Macabeo and Chardonnay varieties. The two red wines that accompanied the tasting two wines were quite successful, the case of Merlot fermented in barrel Martinez Bermell was able to appreciate the wine qualities of many fruits, vanilla aromas, freshness and youth. The second red wine is tasted a Vera de Estenas Crianza 2008, a wine 'coupage' of Bobal, Merlot, Cabernet Sauvignon and Tempranillo, who spent 10 months in French oak casks and refined in one-year deposit and get a wine bottle elegant, with aromas of wood, but closely integrated with a perfect harmony with ripe red fruit, soft tannins and a freshness quite lively due to its balanced acidity. To all this, small works of art ended and the parents had the opportunity to visit the winery and enjoy the beautiful day, fortunately, it was great in this first meteorological October to the harvest in the Utiel winery.